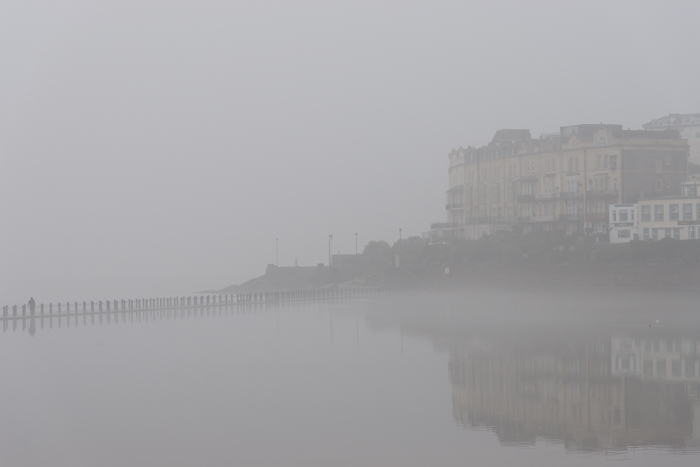 I took myself off to do a photoshoot in Weston-super-Mare on the Somerset coast. Instead of doing that thing you’re supposed to do – seek bright, uplifting light – I deliberately chose a misty day. That, it seemed to me, would be a good way of introducing an added sense of atmosphere to a place pretty well-known specifically, as well as generically: as a typical English seaside town. On arriving in the morning, I found myself rushing around, trying to catch things before the mist lifted. I needn’t have worried – it stayed all day. I took a large number of photographs, many of which I think stand showing. The one I have chosen to put into my blog was taken in the morning, when the mist was at its most dense. I enjoy the way the scene almost vanishes, just leaving enough to make sense of in an otherwise scarcely-defined, milky grey space. Something about the footpath that skims and skirts the water on the left, and the figure just about to walk out of shot, remind me of one or more of Whistler’s paintings and the Japanese prints he was so influenced by. In particular, Whistler’s Old Battersea Bridge comes to mind, as do many wood-block prints by Hiroshige, even if the colours here are rather more muted. No doubt, back in those days, when everyone burned wood and coal to stay warm and keep factories active, dense fogs or smogs were much more common. Such a scene is relatively rare now.